As part of Tokenomy’s continuous effort to provide a robust trading environment, the Tokenomy team conducts comprehensive and periodic reviews of each digital asset listed on our platform to ensure that we cater to the demands of the market and our community. As such, we are announcing that on 29 March 2019, 3 PM (GMT +8) we will be delisting several tokens and trading pairs until further notice. Users should cancel any existing orders of the affected pairs on our platform. Any open orders during the delisting period will be cancelled by the system, your assets will then be credited back to the respective wallets in your Tokenomy account. Thereafter, we recommend users to withdraw the affected tokens to their external wallet at the earliest convenience. More information will be sent out to the affected token holders shortly after this announcement. 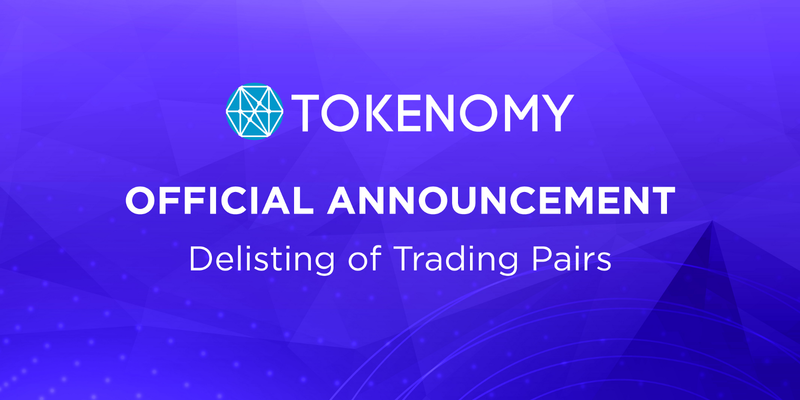 We remain committed to providing the best possible trading experience to our members and will continue to periodically review all listed tokens on Tokenomy Exchange. We thank you for your continuous support towards Tokenomy. Stay in touch for more announcements!